HTC Desire 826 is a stylish and fresh looking phablet built around a 5.5" IPS display of 1080p resolution. The gadget is absolutely identical both in size and looks as the previous HTC Desire 820 model, it even packs the same hardware, but its display has been updated to FullHD, while keeping the (5.5") screen real estate the same. HTC Desire 820 was of a great build quality, and so is the HTC Desire 826. The rear cover is non-removable, which means the battery is not user accessible and replaceable. The nano-SIM and microSD beds are on the left, sitting under a protective rubberized cap. The Desire 826 runs on the Snapdragon 615 chip, which is currently the best mid-range platform Qualcomm has to offer. It comes with an octa-core Cortex-A53 processor with four cores ticking at 1.5GHz and the other four working at up to 1.0GHz. The GPU in charge of graphics is Adreno 405, while the 2GB of RAM will surely help make the multi-tasking process buttery smooth. The smartphone is available in various colors with different base and accent flavors. All of those are made out of glossy plastic but one - the Tuxedo Gray, just like on the Desire 820, is of a matte plastic material which isn't prone to smudges. HTC Desire 826 packs a duo of stereo BoomSound speakers - one of them is located under a tiny strip above the display and the same goes for the earpiece. The second speaker is hidden under an identical strip below the screen. The Dolby Audio enhancement is present on HTC Desire 826 as well. Unlike the HTC Desire 820, the new Desire 826 offers a 4MP UltraPixel camera setup on the front for great selfie photos. There is no LED front flash, but with this sensor you might not need one as it does well under low-light conditions judging by our previous tests with the HTC One and One (M8). 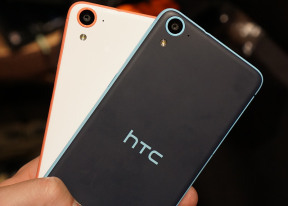 The rear camera of the HTC Desire 826 is a 13MP unit, coupled with a LED flash. While there is no fancy talk on the press releases and press materials about it, we hope it does at least as good as the 13MP rear snapper we found on the HTC One mini 2. Both cameras are capable of 1080p video capturing. HTC Desire 826 runs on the newest Android 5.0.1 Lollipop and HTC Sense 6.0 UI. This combination is already present on some HTC smartphones and aside from the 64-bit support, everything else looks the same. The Asia-Pacific region will be the first to get the HTC Desire 826 by the end of January, with more markets joining soon after. The pricing is yet to be revealed.